So it’s been a successful show season so far (more details to follow!! ), and we have also learnt that the fame (or maybe infamy) have followed our illustrious duo of ferreters far beyond the borders of Wessex! Yes, Baldrick and Turnip have now become infamous in places as far flung as Tyneside – Why Aye the lads!!!! So we made another visit to the golf course, and it was a very successful one! Our biggest haul of the year, doubling the seasons catch and finally making it into double figures! We have decided we can now call ourselves “True Enthusiastic Amateurs”!!!! So as an experiment, I decided to take a new, untested fuzzy friend out for the day. Anyway, big or not, Biscuit had a great day out and actually did a good job, so there! So the next experiment is to find a replacement for hawks and dogs to catch the bunnies that make a run for it, so it’s time to get a cheetah …..
Having recently acquired a new permission, a few intrepid members of The Wessex Ferret Club, with varying degrees of experience, set off to help at a golf course with a rabbit problem, and on a crisp and clear morning (we meant it was freezing!) we all huddled together with our ferrets and made our plan of attack! And it was down to business, in went the ferrets, and we made our first mistake! As we patrolled the long nets in front of the warren, the rabbits had other ideas and went in the opposite direction, while one ferret decided in liked the warren and had to be helped out by digging a new hole! This called for a re-think of battle plans! So filled with the pride of actually having caught something (and coffee) we continued working our way round the course, with our bunny tally slowly increasing, and after 7 hours, we had a fair few to show for our work, a better idea of the lay of the land and a happy landowner, who asked us back to have another go later in the month. So it’s back to the golf course in a few weeks, and making more long nets in the evening, ready for a dream day out at the new bury! Micro-chipping Or How Not To Stab Yourself! One of the services that The Wessex Ferret Club is happy to provide, and encourages it’s members to take part in, is the micro-chipping of our fuzzy friends, at to this end several members took a jolly into the wilds of Wiltshire to learn this mysterious and sacred art, so that the club could continue offering this service to it’s members. Those that arrived early were treated to that great traditional British greeting of the breakfast fry up, and many a happy full belly was seen! After this, a rather sleep deprived trainer appeared, and we were introduced to the dark arts of the micro-chip! The theory lesson and supporting booklets provided a wealth of information, that will soon be appearing on this site, and once everyone was happy, it was on to getting the ferrets out and the much anticipated practical! At this point, its nice to point out that no ferrets were harmed or mistreated, but the handlers and micro chippers didn’t do quite so well! But practice makes perfect, and on the second attempt, everyone was confident enough to get the job done without the onlookers giggling! Don’t eat too many beans when offered a fry up breakfast! The club was lucky enough to get a new permission for ferreting this week, so pretty much a new comer to the working side of owning ferrets (come on they make brilliant pets !!! ), I was invited to tag along and learn all about it. So today we set off for darkest, deepest Dorset (well, Christchurch), and I learnt about getting new permissions, and what you need to do on the first visit and get the lay of the land. Check that you don’t have to cross fences, etc onto neighbours lands, and if you do, make sure you ask for permission! So we checked, worked out how many people and ferrets we need, and what equipment we need, and its back tomorrow! So this afternoon is sandwich making, thermos cleaning and generally making sure everything is ready for tomorrow. How knows, we might actually see a bunny this time! So under the expert eye of Baldric, I mean Pete, we set the nets, excited the ferrets and got ready for the rush! 7 cold hours and several empty coffees later, we decided that rabbits were smarter than us and had gone somewhere warmer! 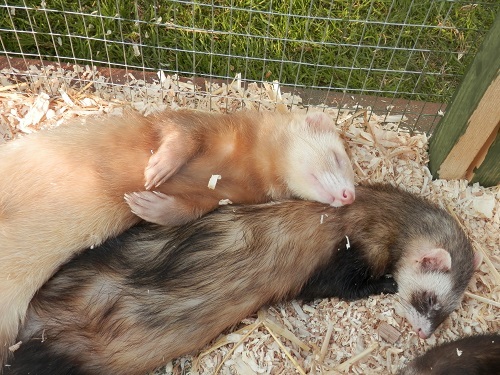 But at least the ferrets (and Baldric) had a good day out! 2015 is going to be a year of big changes for the Wessex Ferret Club, with a new committee, a complete new show routine and lots of changes to both our facebook page and this site! Keep coming back to see what’s happening!